It’s the FIRST DAY!! It’s exciting and crazy, but please don’t forget that we also have our first marching band practice! NEED TO BRING TO SCHOOL: instrument, music, practice clothes (either change into or wear), and camelbak. Practice is from 3:30 to 6:30pm – YOU MUST HAVE A RIDE HOME! Be hydrated (that means drink lots of water, not coke!) and if you haven’t purchased from Charms, bring a snack for after school. You will be glad you did! BBQ Saturday, Aug 15 and MANDATORY MEETING! At least one parent from your family is required to attend this meeting at 12pm this Saturday. We are also inviting your ENTIRE family to our delicious BBQ after! It’s going to be a GREAT day with our entire BAND FAMILY and a great preview of the SHOW – YAY!! This is the time to socialize, ask questions and then get to the CAFETERIA so we can start the mandatory meeting on time. We have a lot to cover! Park in the senior student parking lot next to the football field – ONLY! The bus circle area is OFF LIMITS as we will have band practice still taking place and the grill will be going. Follow the signs that will be posted and you will know where to go – I have also attached the map. This is your opportunity to turn in any forms that are required and necessary payments/dues. LET’S BE 100% COMPLIANT!! ;-). What forms? All can be found within Charms and there is a checklist so you know what is required. Can’t get into Charms? We will have a laptop set up so we can help! DESSERTS! Please bring – we love our sugar! Warrior Wear will be on sale and this is the perfect opportunity to purchase so we can show our support to our FABULOUS kids! And you will want to show your pride as we face Gaither in our first home game on August 28th! So bring your checkbook or credit card and support the most AWESOME band ever! 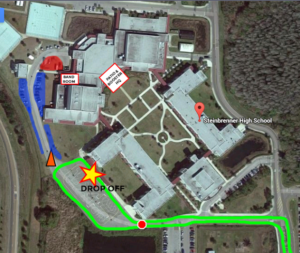 Here is the map – know where to go! Detailed instructions are in the previous post. Let’s go MWB! Turn into the front entrance of the school and proceed to the Bus Circle. If you have already paid for band camp ($60), ALL of your forms are complete (please check the list found in Charms to confirm) AND the health form is notarized, you will simply drive through the designated check-in area, drop off your forms, your student, and 1 case of water (or $10). If any of those things are incomplete, you will park in the bus circle and come to the registration tent to complete forms / pay for band camp / get health form notarized, and turn in / buy water for $10. Only staff and parent volunteers may park in the red zone. Students who are driving themselves to band camp may park in the blue areas. Parent Volunteers: Please report to the Patio/Volunteer HQ on time. This week, we will be serving approximately 700 people each day. Please park in the red zone. If you have any questions before then, contact Ivana Vergara, our volunteer coordinator, before your scheduled time. Let’s get EXCITED! Band camp is HERE!!! Go MWB! This is to help with selling snack items at the school to teachers who will be at training and incoming freshman who will be at orientation. Also, helpers will help sell lunches to teachers by taking orders and getting them their boxed lunch during their lunch hour. It is a great opportunity for our fundraising! Thank you for your willingness to help! Log into CHARMS today and let’s get to work! See you there! Band camp means long days, but dressing up like batman makes it a lot more fun! BUT!! You will need athletic shoes for marching basics! Do NOT show up in flip flops, flat bottomed shoes, Sperrys, barefooted, etc..
See you there in your SPIRIT! !